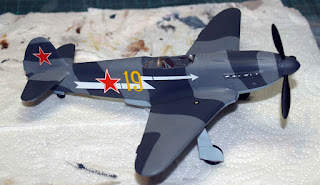 This is the Weekend kit Yak-3 done. I have to say that I quite enjoyed making it and I don't think it came out half bad. The aerial is lycra rigging thread. It was fun running that through the back of the canopy down to the radio box. I have done some weathering using Tensechrom filters. I am currently trying to use lots of different techniques to find out which work best. I am actually finding that almost any technique is worth using but I am happiest with the Lifecolor filters. Its probably because I can spray them and I have a way too close relationship with my Iwata - grin. The base is one of Chris Core's that we sell in the shop. I sprayed it rather than staining it. Not sure that the red works but. I gave it a couple of coats to let the paint sink in - then a coat of Model Air matt varnish. The concrete is actually Vallejo Pumice which gives it a nice gritty texture. I got impatient last night to get on so once I had spread that I put it in the microwave on 5 minutes defrost to get it so set so I could paint it. 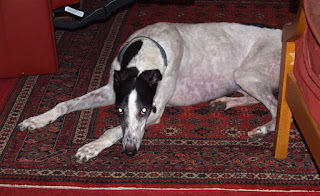 There is then a variety of Vallejo colours -mostly buff and German grey. This was overlaid with - you have guessed it - Tensechrom filters - oil and rust. 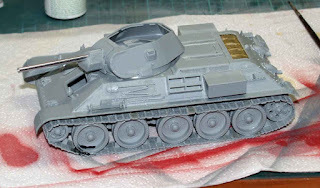 The T-34 for the 'Where's the Famo' diorama is coming on. I just have the turret to finish and then I can get on with the painting. Isn't it strange that, when I had my 'other' airbrush, I loved making and hated painting and now its the other way round. I got a lot of modelling done over the last few days. 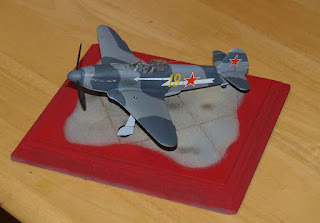 As you can see, the Yak-3 is painted and decalled. As you see it here it has had a second coat of Klear over the decals so I can try some panel line shading. I am going to try sanding down a lead pencil and using the dust to highlight the lines. The big decals down the sides gave me a lot of problems getting them straight. The Yak is an Eduard Weekend kit so there are minimal instructions. The decal sheet has lots of serial stuff on it but no indication where it would all go. Me being me, I have gratefully skipped all of that :-) The cockpit came out quite well. You don't get any seat belts so I made my own. Fortunately I had a standard Yak-3 kit in the shop so I could copy the etched belts. Sunday, Valerie went out for the day so I had all day to model. I took the opportunity to et on with the next part of the Famo-less diorama. 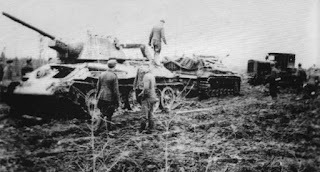 This is the T-34 in German service. This is a newer Dragon kit than I have made before. I found that it went together very well. I have tried to use the etched brass. I think I have got the straps slightly wrong in that the gaps between them are not fully the same but it was 11pm after a b***le of w**e so I am quite pleased :-). 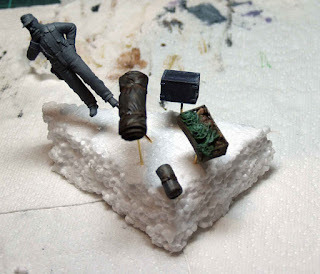 Lastly, I enclose a shot of some of the peripheral items for the diorama - the figure is a relaxed panzer guy (Wolf) whilst the rolls, box of vegetables and the tin box (Verlinden) are for stowing under a tarp on the back of the Stug. Don't forget, you can click on any picture to see a larger version. Back to the shop tomorrow so we slow down a bit now. The Scout Car came 1st at Colchester. That means that both I and Sonia Maes have come 1st and 3rd this year so we are tied for 1st place in the annual competition. Well who would have thought? I took the diorama to Ipswich last week and it seemed to be received well. The results of that competition aren't published until the following month so we have to see if we got any points. Mind you, they have changed the scoring system so maybe I will. Now to whats happening on the modelling desk at the moment. 1. 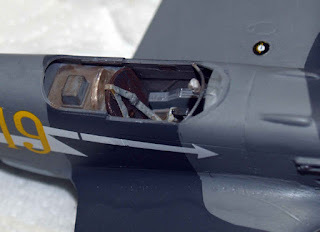 I have the valve gear on the BR-52 - picture below. 2. I have got a long way with my SUG III for the Eastern Front diorama - picture and the original inspiration below. I have the German T-34 still in the box and I will probably have to substitute the Stalinez 65 as the only one available is a resin kit and I'm not going there! 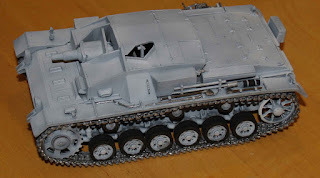 Before anyone comments, I haven't even started detailing the Stug, let alone weather it. 3. I need a new aircraft in the shop window. 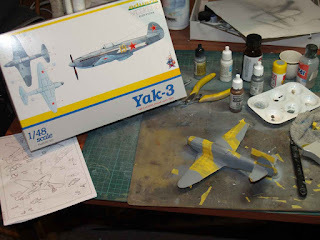 I was going to make a Stormovik but Jan Maes is making one of those so I don't need the competition - Jan knocks these things out quickly but seems to be able to win competitions with them - hence I got a Weekend Kit Mig -3. I am remembering why I started making armour - I do find making aircraft a fiddle. 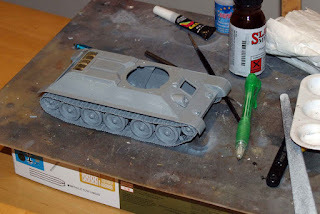 The Stug got made and then painted - the Mig seems to be a lot fiddlier. There is a photo of my desk below.